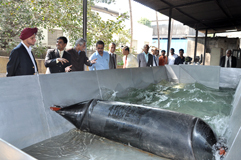 To undertake design & development of rubber composites and process suitable for making rubber dams. 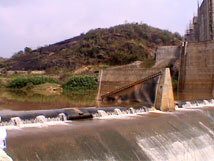 To design and develop different components of rubber dam. To develop and evaluate prototype rubber dams. 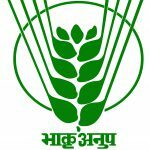 Awarded By National Agricultural Innovation Project (NAIP) under Indian Council of Agricultural Research (ICAR) funded by World Bank. 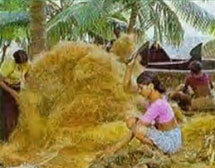 Coir Project for utilization of Coconut Coir / Fiber and its Byproducts in various rubber and allied products. Awarded By National Agricultural Innovation Project (NAIP) under Indian Council of Agricultural Research (ICAR). Contributors: G. Krishna Prasad, S. Periyasamy, S. K. Chattopadhyay, A. S. M. Raja, K. Rajkumar & Santosh Jagadale (Collaborative Research with CIRCOT, Mumbai) . Nylon-6,6 fabric was treated with formic acid for surface roughening and was subjected to Resorcinol Formaldehyde Latex treatment for making rubber composites. Physicochemical effects of surface roughening of nylon were evidenced using scanning electron microscope (SEM), Fourier Transform Infrared spectroscope (FTIR) and differential scanning calorimeter (DSC). Further, the treatment effect on interfacial adhesion was quantified through peel strength test. The process parameters of the formic acid treatment were optimized using Box-Behnken method through geometrical surface roughness obtained through Kawabata evaluation system for micro-surface roughness of nylon to ensure good interfacial adhesion with rubber. Surface modification conditions of 11.2% formic acid concentration, 70 °C temperature and 30 min time were found to yield optimum condition at which surface roughness (SMD) was found to be of 20.1 μm. SEM analysis confirmed the presence of heterogeneous appearance like cracks, etches and microrough surfaces on the treated Nylon-6,6 fibre surface. FTIR analysis showed changes in –C = O stretching and –N–H stretching. No significant change was noted in the DSC curve. The peel strength between the rubber and treated fabric was improved to 150% in warp and 124% in weft directions, respectively with reference to the control fabric. Contributors: S. Periyasamy, G. Krishna Prasad, Sajal Kumar Chattopadhyay, A.S.M. Raja, K. Raj Kumar and Santosh Jagadale (Collaborative Research with CIRCOT, Mumbai) . The adhesion between rubber and the reinforcing textile plays an important role in ensuring the serviceability of composites. The present study aims to develop an enzyme based surface roughening process for nylon 6,6 fabric to improve its adhesion strength to rubber. Polyamide (nylon 6,6) fabric was micro-roughened through catalysed hydrolytic degradation of the surface chains, using a protease enzyme treatment. The concentration of the enzyme was optimized in terms of surface roughness measured by a KES-FB4 surface tester. Scanning electron microscopy (SEM) images of the protease treated fabric showed a heterogeneous rough appearance with cracks and pits. Fourier transform infrared (FTIR) analysis confirmed the surface hydrolysis of polyamide-6,6 due to the enzymatic treatment. Protease enzyme treated fabrics were then subjected to resorcinol formaldehyde latex (RFL) treatment, followed by a rubber moulding. Micro-roughening of nylon 6,6 fibre with an optimum surface roughness (SMD) of 20.3 μm was obtained for 3% enzyme concentration. Physicochemical mechanisms of the optimum effect and enzyme assisted hydrolysis were proposed. In line with surface roughness, peel strength also increased up to an enzyme concentration of 3% and then it decreased, however, the enzyme treated fabric showed higher peel strength than the control fabric. Contributors: K. A. Dubey, Y. K. Bhardwaj, C. V. Chaudhari, N. K. Goel, S. Sabharwal, K. Rajkumar and S. K. Chakraborty (Collaborative Research with BARC, Mumbai). Varying compositions of styrene–butadiene rubber (SBR) and ethylene–propylene diene monomer (EPDM) 50:50 blend containing multiple walled carbon nanotube (MWNT) as nanoparticulate filler (0.5–5%) were prepared and their efficacy for radiation vulcanization was analyzed by gel-content, Charlesby-Pinner parameter, and crosslinking density measurements. Radiation sensitivity of the nanocomposites increased with increase in the MWNT fraction and radiation dose in the dose range studied. The elastic modulus, tensile strength increased with the radiation dose, while elongation at break exhibited downward trend. The extent of reinforcement as assessed using Kraus equation suggested high reinforcement of blend on MWNT addition. The reinforcing mechanism of nanocomposites was studied by various micromechanics models which predicted higher modulus than the experimentally observed results, indicating agglomeration in the nanocomposites. The thermal stability of the composites increased with increase in MWNT loading has been attributed to the antioxidancy induced by nanotubes and higher crosslinking extent of the nanocomposites. Contributors: K. Rajkumar, Nivashri Kumari, P.Ranjith, S.K.Chakraborty, P.Thavamani, P.Pazhanisamy and P. Jeyanthi The high temperature resistant Polymer-nanographite composite was prepared using Nanographite as reinforcing fillers in Acrylonitrile Butadiene Rubber (NBR) and investigated. The effect of increasing nanographite loadings on mechanical properties like tensile strength, modulus and Elongation at break was studied. Mechanical tests demonstrate that the NBR/graphite nanocomposites possess greatly increased elastic modulus and tensile strength, and desirably strong interfaces. Contributors: K. Rajkumar, P. Thavamani, P. Jeyanthi and P. Pazhanisamy The effect of nanoclay in combination with other inter fillers in ethylene propylene diene monomer (EPDM) rubber vulcanizate were studied. Curing characteristics were carried out using rubber process analyzer (RPA). Mechanical, thermal and morphology characterization of EPDM – nanoclay composites were studied. EPDM nanocomposites based on Nano-silica in combination with other inter fillers in were prepared and studied. Mechanical, Electrical, Thermal and Morphology Characterization of EPDM – Nano Composites were studied. Incorporation of nanofillers in EPDM rubber compound found to increase the thermal resistance of nanocomposites and decrease the electrical resistance properties. Contributors: V. K. Abitha, K. Rajkumar, P. Thavamani. The concern for environment and sustainable growth has created more awareness among the researchers to develop composites based on recycled materials and materials from nature. Reuse and recycling extends the useful life of the raw material resources in instances where a market exists for the recycled products, and it is economical to carry out collection and reprocessing. Recycling and reuse of materials have been getting more interest now days. EPDM/ Polypropylene thermoplastic vulcanizates are most commonly used ones. In the current study reclaim EPDM and recycled polypropylene thermoplastic vulcanizates were prepared by melt blending method. Reclaim EPDMand Recycled PP has been melt blended in a Brabender plasticorder in different ratios and the blend with optimized results was selected for preparation of composite.MA-g-EPDM has been added as a compatibilizer in reclaim EPDM/recycled Polypropylene blends. Coconut pith in different ratios was added into Reclaim EPDM/Recycled Polypropylene blends along with MA-g-EPDM and other additives. Physico- mechanical and thermal properties of the coconut pith Reclaim EPDM/ Recycled PP composite has been carried out. The dispersion of coconuut pith in the matrix had been carried out by SEM analysis. Hydrogenated Nitrile Butadiene Rubber [HNBR] is a special class of nitrile rubber that is hydrogenated to increase the thermal stability. The elastomer is known for its physical strength and retention of properties after long time exposure to heat and solvent. This paper concentrated with the preparation of nano silica based HNBR rubber composites with different loading of nano silica. The effects of the nano silica loading on the mechanical, thermo-physical and on thermal stability of the composites were studied. The results were explained by rheological, physical and thermal studies. The transport properties of the of HNBR-Silica nano composites were investigated at different temperatures and was found that introduction of small quantity of the nano fillers leads to significant decrease in the solvent uptake. Dispersion and interaction parameters of the rubber –nano fillers were characterized with the help of XRD and SEM. Dispersed polymer/clay nanocomposites are of great interest because they significantly improve the properties of polymeric material. However, achieving a good dispersion of nanoclay has been a big challenge. An attempt was made to disperse nanofillers in NBR matrix using DOP. The mixing was carried out using two roll mill and rheological properties were studied using Rubber Process Analyzer (RPA). Contributors: Chandresh Dwivedi, K Rajkumar, Maninee Vibhande, Nikhil Shinde, Shrutika Sankhe . Generally, the useful life of a rubber component is governed by its susceptibility to failure by either mechanical or chemical deterioration. There are well established tests to address the failure properties of elastomers – fracture mechanism toinvestigate mechanical durability and also accelerated aging tests for chemical degradation. This paper is presented to experimentally estimate the life span of the rubber blend comprising NR and SBR in a ratio of 3:1 at accelerated ageing conditions. The specimens are subjected to ageing at different temperatures mainly at 900C, 1000C, 1200C and 1500C. The changes estimated at these temperatures were then understood with the help of the concept of Arrhenius theory and were compared to the rubber sample at ordinary conditions and the retention in physical properties was assessed. Baban Suryatal, Haribhau Phakatkar, Kasilingam Rajkumar, Ponniah Thavamani Failure analysis and fatigue life prediction are very important in the design procedure to assure the safety and reliability of rubber components. The fatigue life of a railway elastomeric pad is predicted by combining the test of material properties and finite element analysis (FEA). The specially developed chloroprene rubber material’s fatigue life equation is acquired based on uniaxial tensile test and fatigue life tests performed on the dumbbell specimens of the chloroprene rubber. The strain distribution contours and the maximum total principal strains of the elastomeric pad at different compressive loads are obtained using finite element analysis method. The software used for the FEA was ANSYS. The three parameter nonlinear hyperelastic Mooney-Rivlin Model and plane 182 elements were used for finite element analysis. The critical region cracks prone to arise are obtained and analysed. Then the maximum first principal elastic strain was used as the fatigue damage parameter, which is substituted in the chloroprene rubber’s fatigue life equation, to predict the fatigue life of an elastomeric pad in the number of cycles at different compressive loads. The results were compared with the technical requirements given by Indian Railway’s Research Designs and Standards Organization. These requirements were achieved up to certain extents. The results were also compared with the data available in the literature and a similarity was observed between the results acquired and literature data. In short, the proposed fatigue life prediction method can shorten the product design cycle, decrease the design and product cost remarkably and improve the quality of an elastomeric pad. Increasing concern about global warming and depleting petroleumreserves have made scientists to focus more on the use of natural fibers such as bagasse, coir, sisal, jute etc. This has resulted in creation of more awareness about the use of natural fibers based materials mainly composites. Ecofriendly coconut pith fillers are used as cost effective filler in many of the rubber based composites. The advantages of coconut pith over traditional reinforcing materials such as glass fibers, talc, and mica are acceptable specific strength properties, lowcost, lowdensity, non abrasivity, good thermal properties, enhanced energy recovery and biodegradability, and recyclable in nature.Among various natural fibers, both coir and jute fibers are widely available cheap, relatively water proof and is resistant to damage by salt water. Coconut piths have an outstanding potential as reinforcement in thermoplastics. Commonly used thermoplastics are Polyethylene, Polypropylene, Polystyrene, Nylon etc. These composites are used in automotive components, buildingmaterials. EPDM/Polypropylene blends and composites are the most commonly used ones in the thermoplastic elastomers (TPE) in industry. In this current studymorphology, thermal behaviour mechanical properties of EPDM/ Polypropylene coconut pith composites have been investigated. Coconut pith in different ratioswas added into EPDM/ Polyproylene thermoplastics vulcanizates using Brabender Plasticorder . 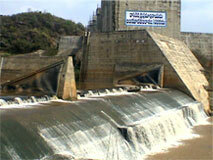 Contributors: Santosh C. Jagadale, K.Rajkumar, R.P.Chavan, D.N.Shinde, C.L.Patil. It is a known fact that Rubber Industry contributes in environmental pollution in different stages. Therefore this paper describes the information about a group of ingredients that causes pollution in the rubber industry. In a rubber product making process, different types of rubber chemicals and additives are added, depending on the requirement of ease of processing, improvement in properties in final product and cost reduction. Generally, rubber compound is made from basic raw rubber, activators, accelerators, fillers, plasticizers, antidegradants, curatives etc. While some other chemicals, such as: resins, wax, metallic coagents, dispersants, prevulcanising inhibitors, binders etc. are also added in order to achieve some special characteristic in the final product. These chemicals and or their complex with other ingredients are considered to be the cause of pollution to environment. Rubber products after use, becomes scrap and dealing with such scrap is a challenge to the Industries. Black Nano filler and their Industrial Applications. Application of Electron Beam Technology in Rubber . New Process of Optimizing Silanization Reaction in SBR Matrix. Partial replacement of Carbon Black with White Filler for Rubber Composites. Synthesis and application of white nano filler for environment friendly rubber products. Bonding Evaluation of Technical Textile with Natural Rubber for Rubber Dam Application. Selection of Rubber and their Additives for improved storage & service life of Rubber Proucts. Application of FEA Concepts in Rubber Product Design – A General Approach with a Case study. Effect of compatibilizer on the Micro structure, Mechanical properties of EPR/PP hybrid Nanoclay Thermoplastic Vulcanizates. The effect of chemically modified aromatic oil in Polychloroprene Rubber Compounding as a plasticizer and comparative studies with Ester type plasticizers. Development of Rubber and Lead-Rubber Bearing for Seismic application for BARC. Development of TPE (Thermoplastic Elastomer) (sponsored by M/s. BRNS). Use of Electron Beam Radiations in Rubber Products especially Tyres, Belts etc – BRNS, BARC. Ageing studies on rubber compound and elastomer isolator to estimate the life of bearings using Arrhenius Model (MOU with BARC) . Development of Rubber compound (material development) sample having chemical resistance to Tributyl Phospate and n-Do-decane (30/70 v/v). sponsored by Indira Gandhi Centre For Atomic Research, Government of India, Department of Atomic Energy, Kalpakkam .